Yesterday we successfully registered the Garland Community Garden and its surrounding riparian area as a certified wildlife habitat with the National Wildlife Federation. We do encourage you to visit the garden and take note of the wildlife that wanders into that area. Some of the critters that we’ve seen coming out of the riparian area include a large owl; a chaparral; opossum; armadillo; numerous bluebirds and other species of birds; and of course, many species of butterflies including Monarchs, Gulf Fritillaries, and Blue Swallowtails to name a few. If you spot a creature down at the park we would love for you to go to our website and report your sighting—insects or animals. It would be even better if you can take a photo of what you see. If you have a question about the garden and what you’ve seen, CONTACT US. To further enhance our ability to attract native pollinators, Loving Garland Green has installed a butterfly garden plot in the front area of the garden. 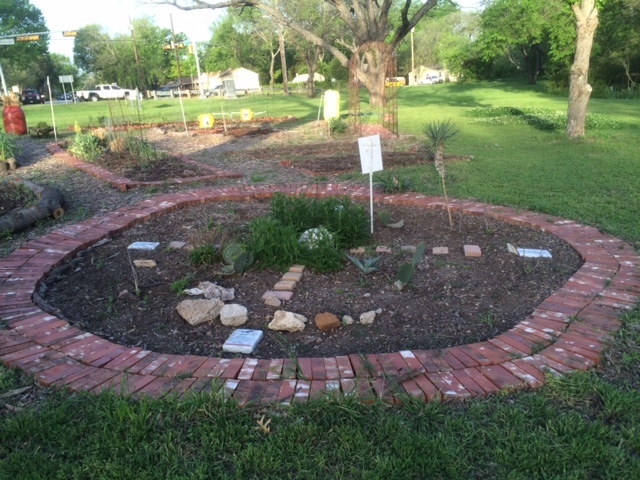 It is stocked with native plants such as Texas Rock Rose; Echinacea; Common Milkweed (Asclepias syriaca)—seeds have just sprouted; Turks Cap; sunflowers; Blue Salvia, Coreopsis; Blackfoot Daisy; Texas Lantana; etc. We have also ordered a native bee house, which we will install (along with a small mud reservoir) on the trellis of our loofah tunnel. We plan to install this bee house on Sunday, April 24 when we celebrate our second anniversary (3-5PM) down at the garden. At this time we will also put up our metal habitat sign. I've been thinking about joining some citizen's pollinator watch group for a while--ever since I spotted a bumble bee on a comfrey plant in my front yard about a week ago. 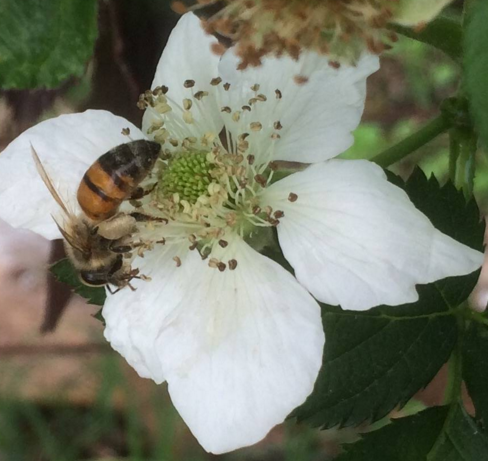 Then yesterday when I saw a bumblebee bee buzz pollinating a blackberry flower down at the garden, I decided to it was time to start reporting. Last night I came across a great citizen science project: BUMBLEBEE WATCH. I signed up and sent them the photo I took yesterday of the bumblebee. What is Bumble Bee Watch? Because these animals are widely distributed the best way to keep track of them is with an army of volunteers across the country armed with cameras. With any luck, you might help find remnant populations of rare species before they go extinct. Participating in Bumble Bee Watch is simple and you can get started now by creating an account via the “sign in” tab at the top of the page. Once you have an account, go out and check your garden, in parks, or any other natural areas you frequent for bumble bees. Be sure to snap a pho and then sign in and submit your data to the Bumble Bee Sightings form at www.bumblebeewatch.org. Have fun while learning more about bumble bees and the vital role they play in our environment! Create habitat! You can find more information about how to create bumble bee habitat at www.xerces.org/bumblebees. Support local and organic agriculture. Many pesticides are harmful to bumblebee colonies and many vegetable and fruit plants provide great food sources for bees. Spread the word! Many people are afraid of bumble bees and other insects. Let your friends and family know how important they are and encourage them to take photos too! SPEAKING OF POLLINATORS . . .
Let us remember the Monarch butterflies. Soon we will be seeing them in the Garland Community Garden. The Monarch, because of its beauty and whimsical grace, is the flagship species, the poster child, to remind us of the importance of all pollinators who are responsible for at least one of every three bites of food that we eat. There are many Monarch monitoring projects that you can join as well. For example, check out the Monarch Larva Monitoring Project (www.mlmp.org ) and learn how volunteers and scientists are working together to understand monarch butterfly populations across North America. Anyone can join the MLMP. 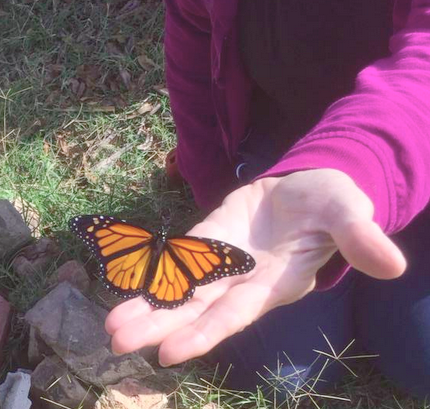 Kids, adults, youth groups, or families--monitoring monarchs provides a fun learning experience for all. It's amazing the degree to which a little education can shift one's perspective. Two years ago my attitude was: "If it's not edible, it's not worth growing." Today I advocate for planting as much as 25% of a gardening space or yard with native flowers and plants that will attract native pollinators. Pollinators are as important to the health and production of your garden as water, minerals or natural fertilizer such as compost. There are more than 20,000 species of wild bees that contribute to pollination--4,000 of which we have in North America. The decline in pollinators is due primarily to changes in land use; intensive agricultural practices; pesticide use; introduction of alien invasive species; resulting diseases and pests; and climate change. One of the most dramatic changes in land use over the past 100 years has been a shift from agricultural to urban use. Along with urbanization we have suburban sprawl a style that lends itself to a homogenized landscape with expansive lawns, a token (often non-native tree), and a few shrubs nestled against the foundation of the home. Despite its greenness (most often achieved with the over-use of herbicides and pesticides), this is in effect a barren landscape that is starving out our native pollinators. You don't have to plow up your front lawn and plant a garden featuring native plants. You and your family will help bring back our native pollinators by simply digging up one of your smaller shrubs and replacing it with a native perennial flowering shrub such as the Texas Rock Rose, or Turks Cap, or one of our native perennial salvias. If you have children you can observe the plant together when it is blooming, taking photos and identifying all the native pollinators the native plant attracts. 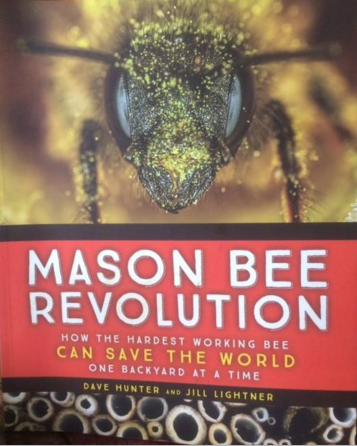 The title for this post is taken from a byline for MASON BEE REVOLUTION, a book written by Dave Hunter and Jill Lightner. The Mason bee, a native North American bee, is the hardest working bee on our planet. One solitary Mason bee’s pollination is equivalent to one hundred honeybees’ pollination. In fact, all native bees are hard workers. Unlike the honeybee who will usually only forage when the weather is nice, our native bees will even work in nasty weather. Spring Mason bees increase spring fruit and plant yields. Research shows that solitary Mason bees can double cherry pollination compared to honeybees alone. These tiny Mason bees also increase the number of seeds from annuals for better reproduction next season. [NOTE: We can save the USA (and perhaps the world) one backyard at a time. If enough people in any given urban area become interested in growing plants and some of the food they eat, these activities will create new markets and also support existing local markets. 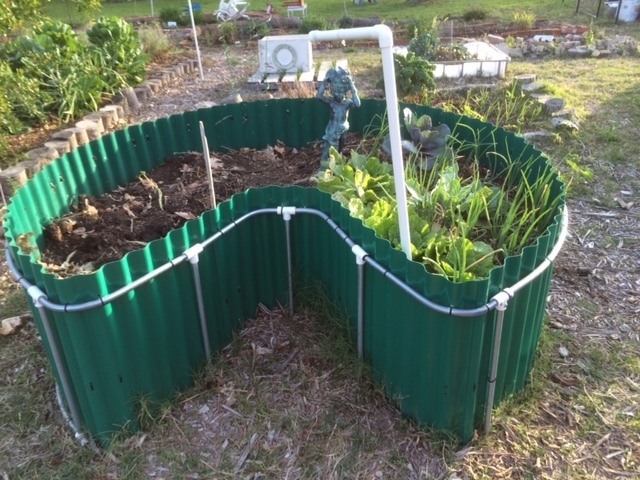 For one tiny example: If enough people in Garland had a four-foot by 12 foot raised bed, some enterprising soul could create and sell a drip irrigation system that is simple to install. It’s even possible this product could grow into a profitable enterprise that might spread throughout a region or even the entire country. If we are going to save the world and achieve a local healthy plant-based economy, we must start paying attention to our pollinators and especially to our native bees. Most folks don’t realize that here in North America we have over 4,000 species of native bees. The honeybee is not among them. It came to North America about 300 years ago with European settlers. With the exception of the native bumblebee, which is social and does make hives and honey, native North American bees are solitary creatures. They make their nests in the ground and in holes. The Mason bees are so called because the females use mud to seal off their egg chambers. Although we have more than 130 species of hole-nesting native mason bees in North America, two of these solitary native bees are the most popular: 1) The blue orchard mason bee and 2) the summer Leafcutter bee. You can even order these bees online. 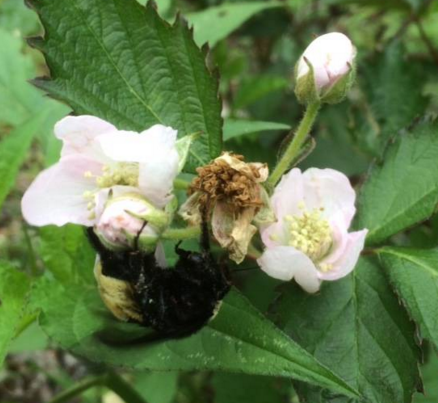 The native Blue Orchard Mason bee is an efficient spring pollinator for fruit and nut trees. The native Alfalfa Leafcutter bee is a great pollinator for summer fruit, vegetables and plants. Male Mason and Leafcutter bees emerge first. They mate with females and then die. It is the lone female’s responsibility to create the protective nesting chamber to lay her eggs. The female Mason bee builds her nest in existing holes. She gathers a pea-size mound of pollen, lays an egg and creates a chamber often within a tube such as that of a reed. 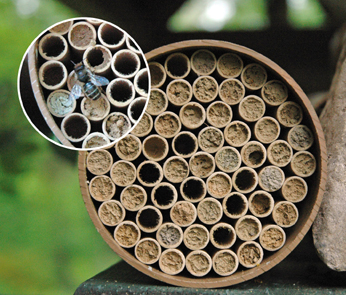 The Mason bees seal each chamber with nearby clay-like mud. One hole might house five to eight egg chambers. (The female lays up to 24 eggs total.) By the end of summer, the new eggs feed off the gathered pollen left in their sealed chamber by their mother and become larvae that then spin protective cocoons in which they hibernate for winter months. The process is quite similar for the female Leafcutter bee; however, instead of mud, the Leafcutter chews up bits of leaves and mixes with bee salvia to form the “mud” to seal the chamber. Solitary native bees are easy to raise and entertaining to watch. An added benefit is their gentle nature. They rarely sting and you don’t need special clothing to observe them and help care for their cocoons. In the rare cases where people are stung, the venom is comparable to a mosquito bit and does not cause anaphylactic shock. Learn how to raise gentle North American native bees. Sign up for BeeMail Newsletter for tips, reminders and research. If you want to see a female Mason bee depositing her eggs, visit the home page of http://LovingGarlandGreen.org . I’ll keep you posted. Several members of Loving Garland Green are going to try to attract some native bees to the Garland Community Garden as well as to our own gardens at home. In fact, one of our members already has acquired houses and has saved and released cocoons of Mason bees in her garden. We’ve looked at some of the bee houses for our solitary native bees and have found most of them to be somewhat pricey. Thus, we plan to make some ourselves to see how that works. The photo below shows the basic construction: A Container within a container within a container, within a container, within a container. The native Mason bee crawls inside these cylinders to lay her eggs. Only one solitary female will deposit eggs in a particular cylinder. The amazing thing is they don't mistake which cylinder is their cylinder. They always return to the correct one. The cylinders are about six inches long and each one will have about 8 eggs in it. The Mason bee, after putting a pollen loaf in a chamber with one egg will seal that egg with mud before laying the next egg. Also they deposit female eggs in the back part of the cylinder and males in the front. Males hatch first. Thus they are waiting near the entrance when the female eggs hatch. The males fertilize the females and die shortly after. One female Mason bee will deposit approximately 24 eggs during her lifecycle. Thus she will use three or four cylinders. I plan to build a box with one side open as shown below. Then I’ll insert an oatmeal box. Inside the oatmeal box I’ll put larger paper cylinders that I’ve made by rolling paper around a wooden dowel. Inside that cylinder I’ll put paper cylinders that I’ve made by rolling paper around a pencil about four times and taped to hold. The tubes will be approximately six inches long but varying slightly in length, as that is one of the ways the female bee identifies her nest. The oatmeal box will be cut to about 7 inches tall and the box will be about 8 inches deep to provide an overhang. The open sides will face south for morning sun. In addition to the box with the plastic straw, I may create the larger cylinder from paper by rolling it around a larger wooden dowel and taping. I’ll also put some smaller paper straws in the mix. These are for the smaller leafcutter bees. Mason bee homes need to be put out before the end of April. We will also build a little native clay soil mud box to put near the nest. If there is not mud near by for the female to seal her egg chambers, she won’t nest there. It is recommended for the nest to be placed about five feet seven inches from the ground. Down at the garden, we plan to attach ours to the trellis for the loofah tunnel. 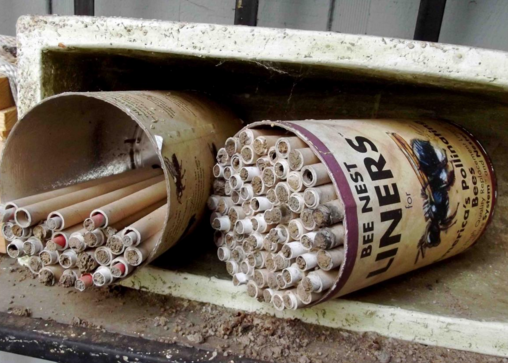 Standard Mason Bee Nest Kit with 68 tubes for $11 from Kinsman Garden. In addition to the Mason bee home I’m building, I ordered one for $11.95 ($20 with shipping) from Kinsman Garden online. It is shown in the photo above. The photo below shows one of the thousands of North American native bee homes that can be built. Rohdes, one of our local nurseries here in Garland has various native bee homes for sale. You can also carry your protection of these valuable native pollinators further by harvesting the cocoons from these tubes in the fall and storing them in your refrigerator (not freezer) over the winter. To do this you will need a plastic container such as a plastic berry container with a few holes punched in top, and a sponge on the bottom. You will need to put one tablespoon of water on the sponge a month. You can of course leave them in the tubes as this is how nature does it. However, it is likely that not as many will hatch. This weekend begins at 12:30 today with the installation of an irrigation system at the Garland Community Garden! From 12:30 to 3PM today Susan Metz will be installing a drip irrigation system in one of the beds down at the Garland Community Garden. The public is invited to watch Sue work and learn how to do it yourself. We have yarrow, Turks Cap, sunflowers, Echinacea, Kale, mint, lemon verbena, blackberry bushes, and even some petunias. While they last we also have some packets of Texas Native Milkweeds that we are giving away. 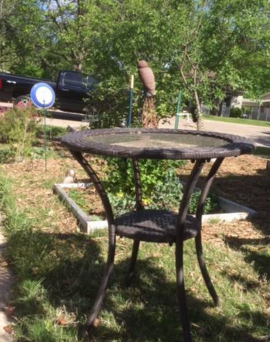 Oh and we also are selling four garden tables for only $12 each. Three of them are brand new and are still in their boxes. INVITATION TO ALL LOCAL NONPROFITS AND SCHOOLS AND INDIVIDUALS: If you have already had your plant sale and have plants left over. Bring a table and come on down to the garden! We won't charge space rent. 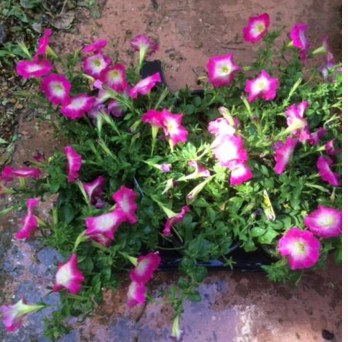 You are welcome to come sell your plants with us. You must manage your own table though. The National Wildlife Federation today announced the launch of Butterfly Heroes presented by Subaru with a goal of 100,000 Americans pledging to help save monarchs and other critically important pollinators in 2016. To help reach that goal, the National Wildlife Federation is distributing over 50,000 Butterfly Heroes Garden Starter Packets for those who take the Butterfly Heroes pledge, and corporate partner, Subaru will give out a further 50,000 at its retailers nationwide. 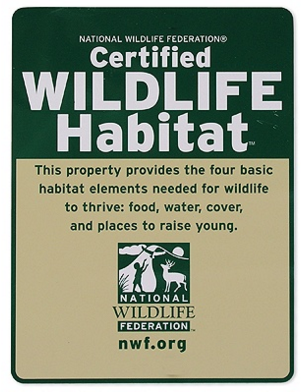 The Disney Conservation Fund is also supporting the NWF effort as part of its mission to protect the planet and help kids develop lifelong conservation values, and Botanical Interests is the official provider of seeds in the kits that participants receive when they make a formal pledge to become a National Wildlife Federation Butterfly Hero. And the garden grows . . . and yes, despite all appearance of a serendipitous path, there is a big plan for the Garland Community Garden moving it forward. 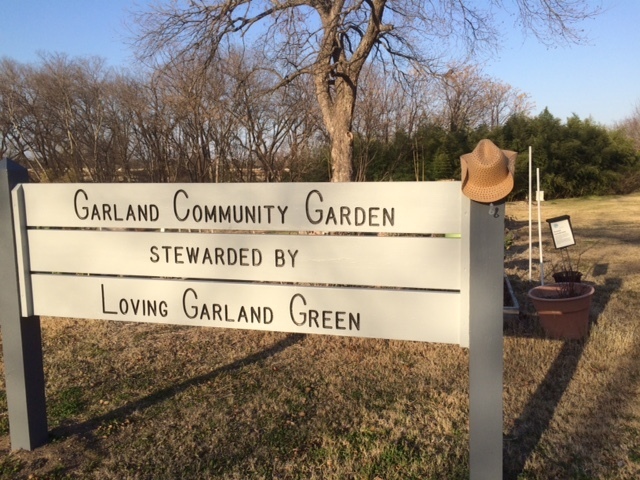 Soon, on April 24, we will mark our second year down at the Garland Community Garden. It's still hard work but some of the rough edges are beginning to smooth out and management of the beds is becoming a little bit easier. Next year should even be easier. If you plan your garden well, by the end of its fourth or fifth year, it should not require a lot of long heavy hours of labor. Basically this means a mixture of about seventy-five percent perennials (most of which are native) to 25% annuals and following an organic, no-till method. Mother Nature will eventually kick in and work with you. We now have several established beds filled with perennials that will begin their second year of life and a few that will begin their third year. Community Gardens are difficult to sustain over the long haul. Members move, people lose interest, etc. But all in all I think that many community gardens fail because they become too much work and one of the main reasons they become too much work is because most community gardens contain 90 to 100% annual plants and still follow the old till method of overturning the soil each season. These types of gardens are extremely labor intensive. This is not true for the organic (no pesticide), no till gardens that contain a high percentage of perennial plants. They are designed to eventually let Mother Nature do most of the work. Ruth Stout had the right idea over 50 years ago. Her “no-work” gardening methods allowed Ms. Stout to garden until the she died at age 96. Coming back for a repeat performance in the loofah tunnel bed we have yarrow on the left, Sweet William in the middle, a Butterfly Bush and a Pine Needle Milkweed. Soon we will be planting loofah seeds and installing a few loofah plants. Unfortunately, loofah is an annual. The Loofah Tunnel will begin its second year of existence. In the bed in front of its trellis we have yarrow, a Sweet William, a butterfly bush and a pine needle milkweed. 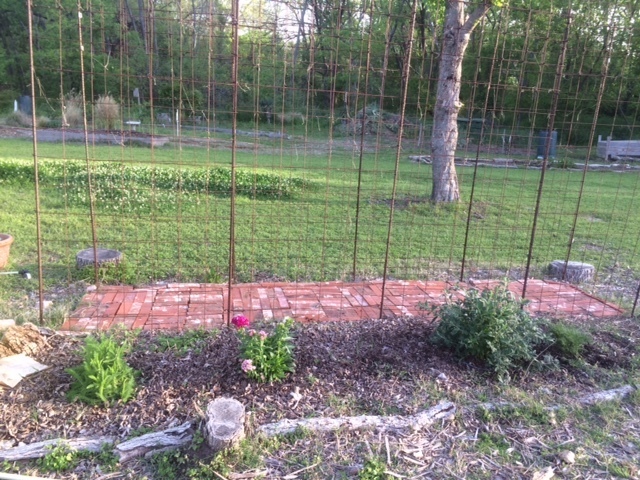 This year, instead of having to build the trellis, lay the brick path, and plant seeds; all we need to do is to plant loofah seeds and install a few loofah plants. The Buffalo Grass is beginning to emerge from its winter dormancy. The Buffalo Grass Plot has already begun its second year. Last year we ordered buffalo grass seed from the Native American Seed Company and planted it the middle of March 2015. It took almost four months to get established and it was a battle keeping the Bermuda grass from chocking it out. Today, however, the turf is well established and is awakening from its winter sleep as it turns green again. Buffalo grass is the only native turf grass in North America and it has many merits to recommend it. It is extremely drought-hardy. You do not have to mow it ever and you never have to fertilize it. I have fond memories of inviting visitors last summer to slip off their shoe and walk barefoot over our Buffalo grass. A reminder of what once was. We in the DFW area are part of an eco-region known as the "Blackland Prairies." This area covers 19,400 square miles and stretches from the Red River southwesterly to San Antonio. Due to agriculture and encroaching urbanization, less than 1% of these native prairie lands and their native grasses remain. The Blackland Prairie Sampler is another success story of plants that will come back year after year. Much of the grass in this sampler plot was grown from seed and all of it is native grass that once grew all over this area of North Texas (except for some naughty invasive non-native Bermuda grass) . The Hops Barrels - Talk about thriving on neglect! Last year after talking with several commercial hops growers in Oregon, Wisconsin and in New England, we decided to order some rhizomes and see if hops can be grown in Garland, Texas. It was recommended that we try to grow a variety called "Cascade." They did grow, but their bines seemed somewhat fragile. In late August they produced 12 hops flowers. Since we harvested the flowers, we have done nothing with the rhizomes in the two blue barrels. However, last week I noticed the bines have returned and they are much stronger looking than last year. 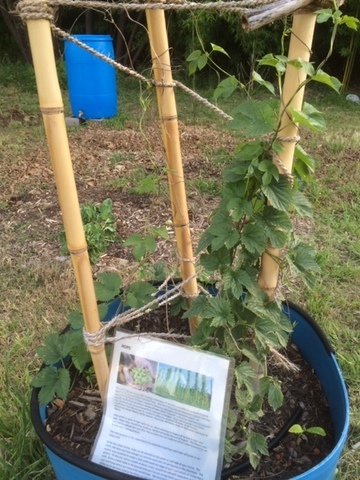 I had considered replacing the hops with another plant, but now I think we will add more twine to allow them to climb to their fullest height this year. 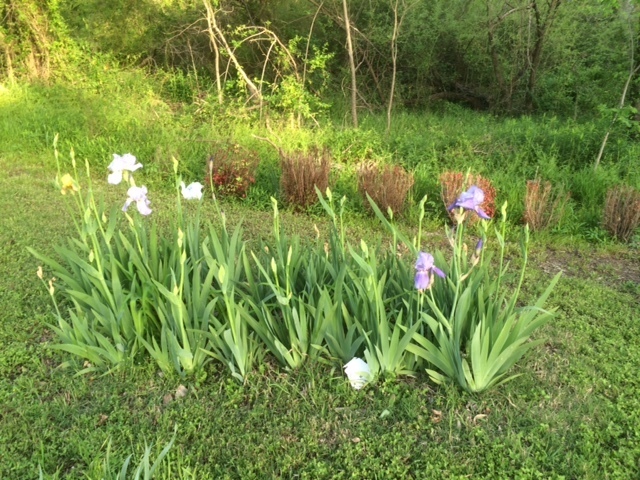 Below are some iris in the garden--another repeat performance from rhizomes. The Medicine Wheel - The Medicine Wheel won't begin its second year until August 2016, but already I can see the signs of permanence showing in the face of its enduring and returning perennials. First there are two large clumps of Mexican Tarragon beginning their seasonal return. Then we have four clumps of prickly pear cactus. The prickly pear cactus was designated the official plant symbol of Texas in 1995. Found in the deserts of the American southwest, the fruits of most prickly pear cacti are edible, and have been a source of food to Native Americans for thousands of years. I am still in awe of how easy the prickly pear cactus is to propagate. Anita, Loving Garland Green’s treasurer, simply placed four sections of a prickly pear on the ground. We watered them and now, less than a year later they have multiplied. 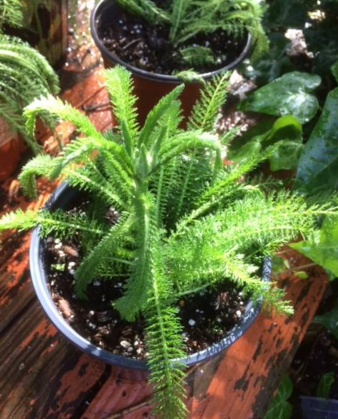 The four clumps of yarrow are five times larger than they were in August. In the next week or two we will be adding some native milkweed to the Medicine Wheel. Native Americans used the milkweed for many purposes: from material for ropes to medicine for healing. The blackberry bushes – Scattered throughout the garden are 30 blackberry bushes. The blackberry is a dependable producer here in North Texas and I wholeheartedly recommend for folks to plant four bushes in their yards (if you like to eat blackberries). I’ve found the thornless varieties with Native American names such as Arapaho, Apache, etc. are extremely productive. The four bushes in my own yard have consistently yielded 60 pounds of blackberries for the past two years. Blackberries freeze (and thaw) beautifully. They are chocked full of antioxidants and they are expensive to purchase in the grocery store—averaging $5.00 for six ounces over the year. Of course they are cheaper in season, but by December they are up to $5.98 for six ounces. 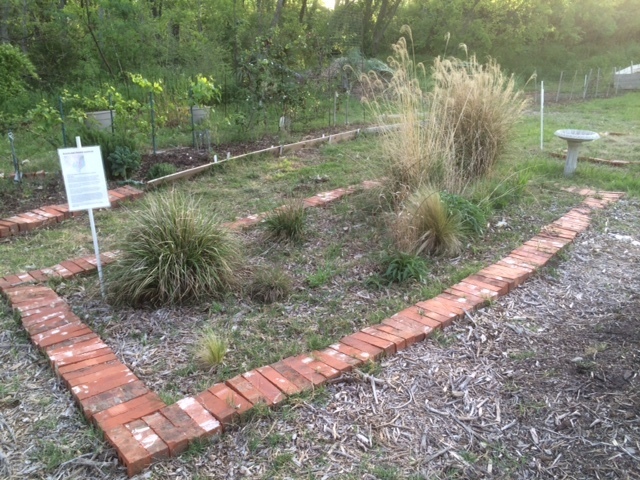 The Spiral Herb Garden – Lavender and Oregano have survived from 2015. This unusual bed, patterned after herb gardens from hundreds of years ago in monasteries in Europe, begins its second year of existence in June. Today I’ll be adding an ancient herb to it—horehound (Marrubium vulgare). Horehound s a grey-leaved herbaceous perennial plant, somewhat resembling mint in appearance, and grows to 10 to 18 inches tall. Horehound has been mentioned in conjunction with medicinal use dating at least back to the 1st century BC, where it appeared as a remedy for respiratory ailments in the treatise De Medicina by Roman Aulus Cornelius Celsus. The Roman agricultural writer Columella lists it as a remedy for expelling worms in farm animals in his important first-century workOn Agriculture.Since then, horehound has appeared for similar purposes in numerous herbals over the centuries. More recently a 2011 study concluded that the essential oil of M. vulgare contains potent antimicrobial and anticancer properties. Also in 2012 another study found marrubiin, one of the primary active compounds found in horehound to possess antidiabetic, antiatherogenic and anti-inflammatory properties. 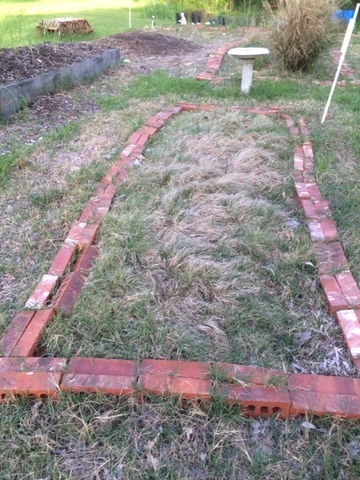 Soon we will add soil to top this off and plant some vegetables in the keyhole garden. This design is especially handy for those who don't like to bend over. By providing a hard surface around its perimeter, this garden space becomes wheelchair accessible. Unlike other gardens, the plants in the keyhole are crowded very close to each other. How close? Deb Tolman told me last year that she has seen 50 tomato plants growing and producing like crazy in one of these beds. And while you are there, pull a weed or two or water a plant that appears to be thirsty. Stop by one of our annual beds. We have recently planted a tomato and basil plot. Read some of the signs in this bed and you may be surprised to learn that North America has 4,000 species of native bees and the honeybee is not one of them. The Europeans brought the honeybee to North America over three hundred years ago. Furthermore, the honeybee is of no use when it comes to tomato flowers, which have no nectar. It is our native bees (the bumblebee and the Mason bee) along with the wind who pollinate tomato flowers. We invite you to come to the garden and learn more about our native bees. Speaking pollinators, Loving Garland Green members are in the process of installing a butterfly garden to help promote our Mayor in his efforts to encourage our residents to plant native milkweed to support the Monarch butterflies. We have planted some native milkweed in this plot and currently have three varieties in various stages of development: 1) A seed bed of Asclepias syriaca 2) Seedlings of Asclepias tuberosa and Asclepias viridis.